This Earth Day, Emerald is proud to announce are membership to the Ricoh Eco Excellence Program. Membership in the Ricoh Eco Excellence Program is awarded only to dealers that meet key criteria — including the dealer’s track record of environmental sustainability commitment and ability to provide customers with education, awareness, program support and guidance. Sustainability and eco-friendly practices are important to our company as a leader in our business community. We are committed to reducing our own environmental impact and helping customers do the same. When customers work with us, they can be confident that our team is prepared to talk about sustainability, educate about best practices and lead them through the products, services and solutions that have environmental benefits. 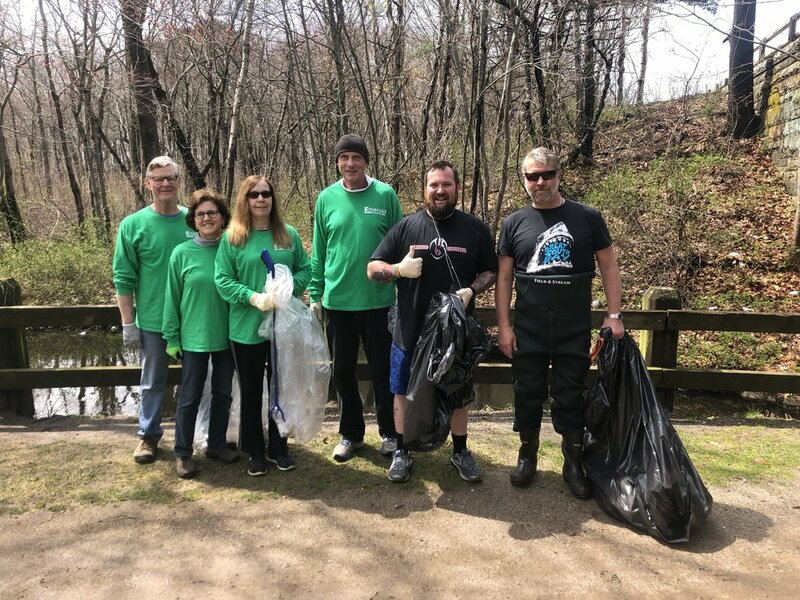 For the second year, Emerald Document Imaging spent the weekend participating in Save The Great South Bay’s Creek Defender Program in Babylon in early recognition of Earth Day. Throughout the month of April, our team proudly wears our emerald green as we work together to support green initiatives that help protect the environment. 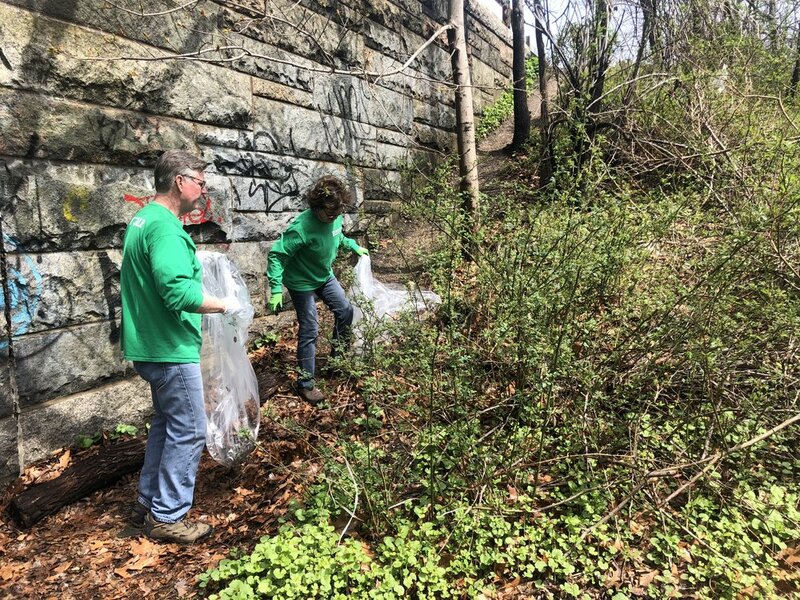 We strongly believe in giving back to the community and welcome the opportunity to work alongside our neighbors and friends to clean our local waterways. 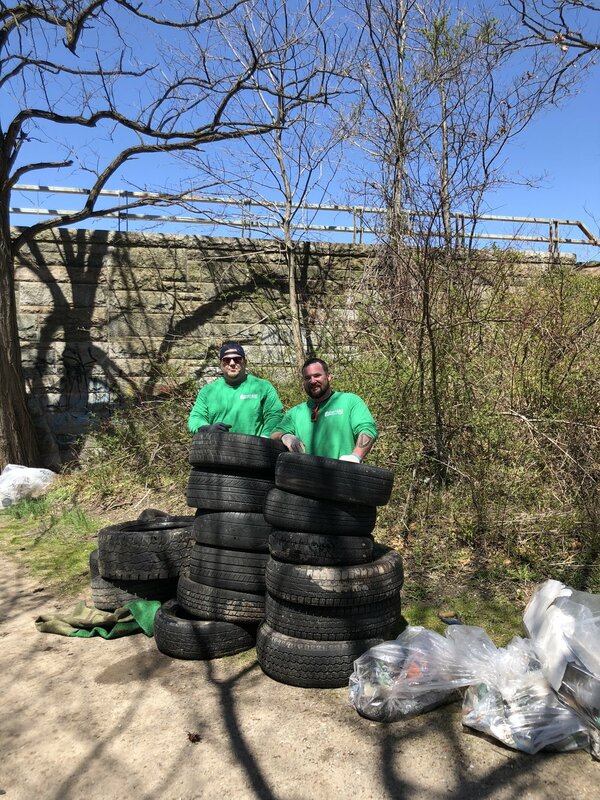 During the cleanup, we filled bags with pounds of trash, found and removed tires from the creeks alongside Sunrise Highway, and walked throughout the creek pulling out various plastic debris – and even an old shopping cart! Our efforts alongside the other volunteers are to work towards improving the conditions of our existing ecosystems to protect the Great South Bay and to sustain natural resources for the current and future generations to enjoy. Learn more on how to get involved in STGSB Creek Defender Program here. I started working for Emerald in October 2016. My first Christmas party at Emerald. It was like one big family. My first job was shucking clams at Nathan’s Famous. I could eat spicy Mexican chicken tacos every day for lunch. I would love to be a working service dog. I don’t watch Netflix but my kids could give you 10. How would you spend a Ferris Buller’s day off? I would spend it sitting on the beach reading a book. I loved Bewitched and Family Affair. Join Us for Save The Great South Bay's Creek Clean Up! April is one of our favorite months at Emerald as the weather gets nicer and we gear up for Earth Month! Emerald is proud to participate in Save The Great South Bay’s third annual Creek Defender Clean Up on April 13th. 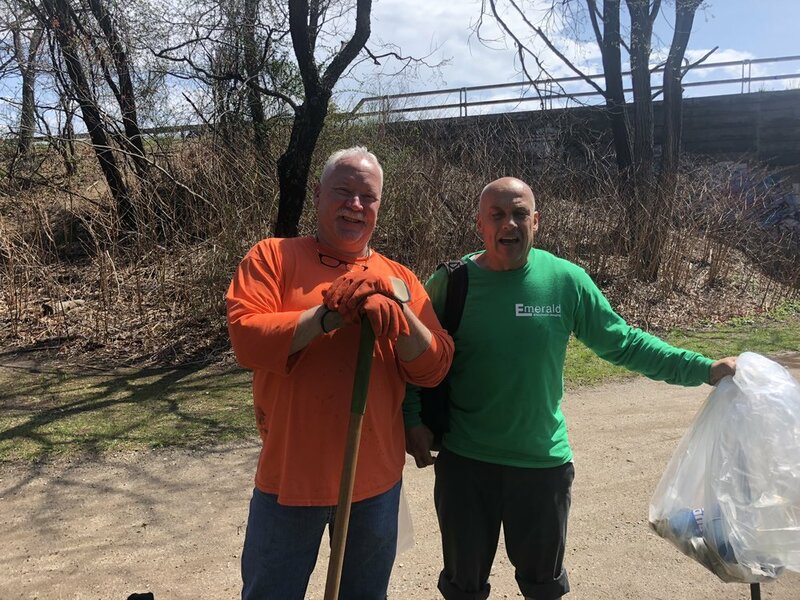 Last year twelve members of Team Emerald participated, along with friends and community members, in cleaning stretches of creek, forest, park and highway in Babylon. We encourage our customers, friends and community members to join us this year, on April 13th in Babylon for the clean up. You can sign up to volunteer with us by filling out this form. Everyone is welcome and you can help for as long or short as you want! I am in charge of all functioning company items that come in and leave the building. My job is to allocate parts items in different inventory systems while providing a functional platform for our system technicians to operate. I am also currently re-designing the machine storage system that is used in our warehouse in hopes to ensure a more efficient service department and returns process. I coach varsity lacrosse at West Islip Highschool. I am getting my Master’s degree in Education. If you were Ferris Bueller, how would you spend your day off? Ricoh – one of Emerald’s premier partner dealers – announced their new line of intelligent multifunctional copiers this week. The new MFPs are engineered to meet the constantly changing needs of digital workplaces – today and in the future. Always Current Technology - allows your printer to activate new features and firmware updates as they become available to stay current, much like updates on a smartphone. Ease-of-use and Customization - new sets of applications that are made for specific departments and industries. The subscription-based model will allow businesses to always have the most current technology without having think about adding new features. Cloud Workflow Solutions - new subscription-based cloud applications to improve your scanning workflow, automate the process of digitizing info, and send documents where they need to be with ease. Security and Uptime - the new MFPs will be equipped with tools that allow technicians to access and fix problems remotely and diagnose potential problems quickly and without having to step foot in your office. Newly Improved Smart Operation Panel - a faster, highly customizable display panel that can be tailored to your company’s needs and avoid the hassle of confusing navigation screens. The new devices are designed to grow with your business, leaving headaches of outdated information with older technology behind. The new RICOH IM C Series comes with an “even smarter” Smart Operation Panel than that of the previous models. With the new interface supporting Always Current Technology, users are able to activate desired features, download smart applications, and upgrade software as needed – very similar to the user experience customers are used to with their smartphones and tablets. It is now the user who has the ability to advance the technology – eliminating the calls to technicians for simple software updates. These cloud-based applications are affordable, subscription-based offerings that help eliminate manual steps, so businesses can maintain their focus on core activities in their business. The new line of solutions includes a range of simple and complex software that supports intelligent scanning, data extraction, and integrates with cloud-based applications. A key aspect of empowering digital workplaces is making information in all its forms reliably secured and accessible. We are excited about a new set of tools and applications that will allow our service experts to remotely access the operation panel, automatically update your firmware and send proactive diagnostic emails to our technician to catch problems faster. The new operation panel features a faster processor, which allows you to navigate your printer’s menus faster and more customization options to tailor the system to your needs. All of this is built on the familiar look of Ricoh’s operation panels that long-time users will recognize with ease. Ricoh's Dynamic Workplace Intelligence is realized in six new intelligent MFPs, the RICOH IM C2000, IM C2500, IM C3000, IM C3500, IM C4500 and IM C6000, which print at 20, 25, 30, 35, 45 and 60 pages per minute, respectively. They deliver printing, scanning, copying, finishing and faxing support for output sizes up to 11" x 17", and standard mobile printing support. They deliver the fastest scanning speeds on the market at 240 ppm. They also offer features to help detect jams and misfeeds quicker, a small document scanner that’s ideal for checks, receipts and smaller paper items, a frequent need for accounting, financial and educational offices. The new line also offers new finishing options - like the new multi-folding unit - to help bring the production of brochures, marketing material, and external facing documents in house. Ricoh grows with you –providing an easier way to work in your changing environment. At Emerald, we are proud to partner with Ricoh, and look forward to seeing the ways this new technology can help your businesses excel! I work in the supply department. I handle accounts receivable, customer support and whatever needs to be done for our team and customers! I will have worked for Emerald for 9 years in May. My favorite memories at Emerald are the barbecues in the warm weather. I worked at the Five & Dime as a kid. Talking to my customers and getting receivables in. This year, the Emerald employees and community supported the John Theissen Children’s Foundation Toy Drive. John Theissen Children’s Foundation provides toys and support to children in need at local children’s hospitals and child-care facilities. We collected about 80 items to be given to children this Christmas. I was a shop boy for the electrician my brother worked for. I cleaned the shop and put away what they didn’t. Going on service calls, helping customers on the phone and help with operations. Helping the customers, advising them and making them smile! I’ve been with the company for 5 years, and December 12th will be my 40th anniversary of being a field technician. Having a “tough customer” become friendly and become a “not so tough friend”. The last place I visited is always my answer. Cuba, the Keys, Hawaii. St. Jude’s. I had a young great nephew who was in a bad state and knowing that if his parents didn’t have the good insurance that he would have received treatment because of this organization. For the second year in a row, the Emerald Document Imaging team joined nearly 250k people walking in hundreds of cities across the country in support of the American Foundation for Suicide Prevention and their mission to save lives and bring hope to those affected by suicide. The Out of the Darkness walk took place at Jones Beach this past Sunday, October 28th where there was an excellent turnout from the Long Island Community and our Emerald Team. “I walk in support of those lives that were lost, and those who still suffer from mental illness. I believe the work of the foundation is really important in bringing more awareness to mental health and suicide. 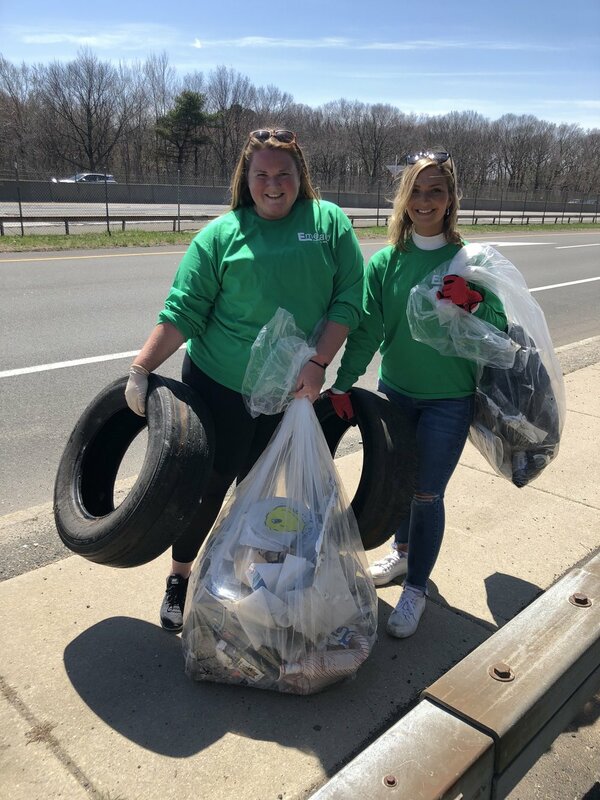 It’s really cool to be a part of a company that involves themselves in giving back to the Long Island Community and the causes they care about” said Emerald employee Kelly Douglas. To learn more and to get involved please visit https://afsp.org. My first job was working in the warehouse and going on deliveries and installs for Emerald during summers in high school. I’m an account executive at Emerald Document Imaging. My typical day starts at the office where I answer emails, complete paperwork and check my LinkedIn. By the afternoon, I visit my customers and spend time prospecting. My favorite thing about my job is meeting with customers. You never know what kind of business you will walk in to. There are some really interesting jobs out there that a lot of people wouldn't think of. I have worked 3 1/2 years in sales at Emerald. A total of 12 years counting summers when I was in school. I don’t have just one favorite memory, but I particularly enjoy when we work as a team at Emerald, especially when we are giving back to the community. 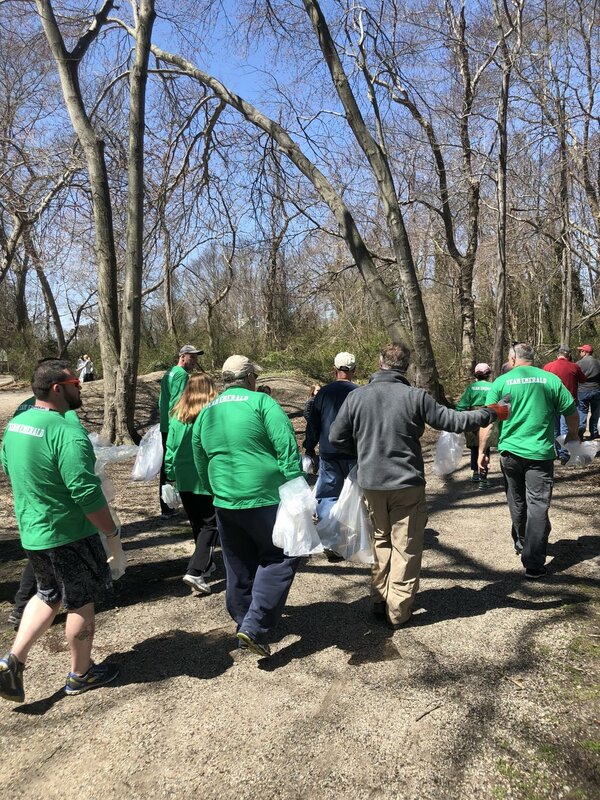 As a team we have supported many different causes including the AFSP (American Foundation for Suicide Prevention) walk, Save the Great South Bay clean ups and more! Success is never final and failure is never fatal. I have it tattooed on my arm. All are welcome to participate in the Emerald Document Imaging 2018 Halloween Costume Contest! Dressing up for work? Trick-or-treating with your kids? Hitting the town in character? We want to see how you’re celebrating! Send us a picture via message or in the comments of our social media platforms on Facebook, LinkedIn, or Instagram on October 31st of your costume for a chance to win a $50 Amazon gift card! Meet Emerald Document Imaging’s Operations Manager, Steve Hurley. At Brooklyn Union Gas as a maintenance guy at 17. After college, I worked in banking. I’m the operations manager. It is my job to keep the place moving all day from when the doors open until they close. I work with our external customers through our technicians. And I am most gratified working with our sales team, my internal customers, to get the equipment out properly and quickly to their customers. #3: What do you like most about your job? The production aspect of it. I like that we provide good service for our customers through our technicians who represent Emerald so well. #4: How long have you worked for Emerald? #5: Your favorite memory at Emerald? It was a new install out at the Hamptons. They were in a brand-new building and we outfitted the whole place – fully stocked with printers, production machines, and their MFP’s. #1: What’s your favorite place you’ve ever visited? #2: What’s the best advice you’ve ever heard? “Treat people the way you would like to be treated” It works professionally and socially. #3: Do you have a favorite charity you wish more people knew about? I’ve always supported the United Way general fund. #4: What’s your favorite breakfast cereal? #5: What is your favorite season? Spring – I’ve always liked it. It reminds me of being up in school at Manhattan College and the warm air and everything coming to life on the quad. For the second year in a row, the Emerald Document Imaging team is joining nearly 250k people walking in hundreds of cities across the country in support of the American Foundation for Suicide Prevention and their mission to save lives and bring hope to those affected by suicide. We hope to have an even bigger turn out than last year with lots of support from our Emerald Team. Anyone is welcome to join! We are pleased to announce that Emerald Document Imaging will be undergoing a full office renovation during the final weeks of the summer. Our exciting construction process will include a full expansion of our office space to accommodate our growing sales team, along with a complete overhaul of our showroom to give our customers a brand-new experience center. The technology industry is changing, and we are fully embracing this change. We look forward to introducing our customers to the latest and greatest from our top of the line manufactures, Ricoh and Canon, while continuing to deliver our personal touch as a local company. We believe in our tag line – Be good. Be fun. Be accountable. – and that’s how we want to be viewed by our customers, co-workers, and competitors. We understand working with technology, and when something goes wrong for our customers we go above and beyond to give them the service and urgency they deserve. So, we’re taking that mentality inhouse. These renovations will allow our team to work together more collaboratively than ever before with new workstations, improved technology, and a warm, welcoming space to enjoy together. At Emerald, it is widely known that what we pride ourselves in most is being interwoven in the fabric of the communities we live and work in. Our new customer experience center has us thrilled to be able to do so even more than ever before. This space can be used by employees and customers alike to serve as an event venue to host a variety of networking groups or keynote speakers, all the while continuing to serve as a central location to demo our hardware, stage production print workshops, and so much more! Although we will be under construction for the next month, we will be fully functioning in all capacities ensuring our excellent service will not be interrupted. Our whole team will be accessible to you by phone and e-mail as we work to make these improvements. To see our progress, please be sure to like Emerald Document Imaging on Facebook and LinkedIn or follow us on Instagram @emeralddocumentimaging. This truly is an exciting time for our organization, and we can’t wait to share it with all of you. The Emerald Document Imaging Team. Emerald Document Imaging attended the Ricoh Family Group Dealer Conference, ConvergX, this past week in Las Vegas, Nevada. This gathering brought together the most respected Ricoh dealers in the industry from all over the US and Canada. During the conference, our team learned about the changing industry of office technology and software, shared success stories and pain points with our peers, and heard from the upper management team more about the great fiscal health of Ricoh as an organization. With the help and support of Ricoh, we are confident our team will continue to give our customers the latest and greatest products and service. One of the main topics of the event was digital disruption and posed the question: will your business be disrupted or will it be the disrupter? Disrupters are the ones ahead of change, turning inventions into innovations and finding new ways to use and promote new technology. Ricoh promotes embracing the changing technology industry and staying completely up to date for their customers. ConvergX was all about keeping our customers up to date by being these industry disrupters. Ricoh invited some of the best "disrupters" of the technology industry to share words of wisdom with our dealers. These industry leaders embraced change and are constantly thinking of new ways to utilize technology which included the conference's key note speaker, Terry Jones, Founder and Former CEO of Travelocity and Former Chairman of Kayak.com, presenter Sam Richter, the creator and founder of the Know More sales and business improvement program, and presenter Scott Klosoky, the founder and principle of technology consulting firm Future Point of View. They were extremely informative and inspiring with great knowledge about the technology industry.